Retro is always in; in the ET closets, that is..
Les chaussures for sale in the Marais. With a little courage and a good sense of balance, you can be stylishly shod. The ETs’ admired the audacity of these shoes, shortly before our vertigo kicked in. Young Frenchwomen wear them, and what’s more amazing, they traverse the cobbled streets at an alarming speed. You’ll still see older elegant ladies in sensible pumps, but if you want to live dangerously in style, these are the ones for you. 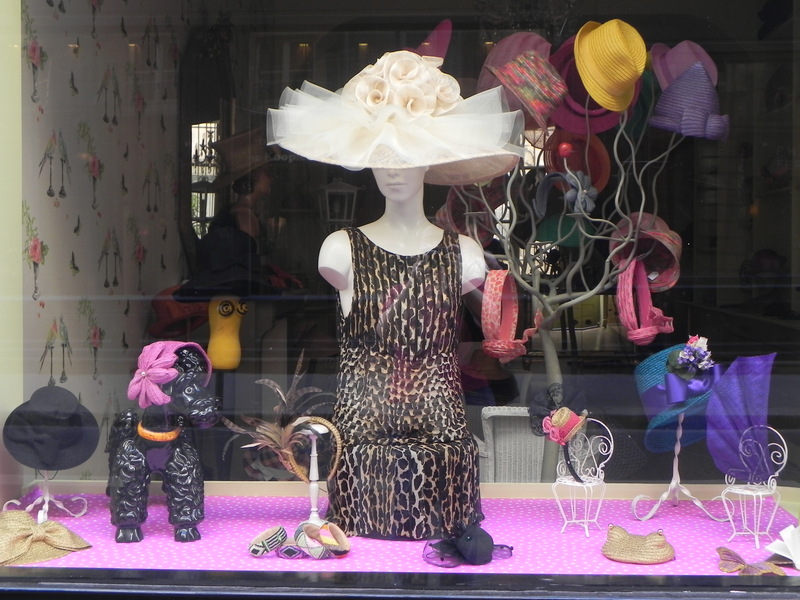 Parisians are not great hat-wearers, but that’s not to say you can’t statisfy a hankering for a stylish topper in the rue St-Louis en Île. 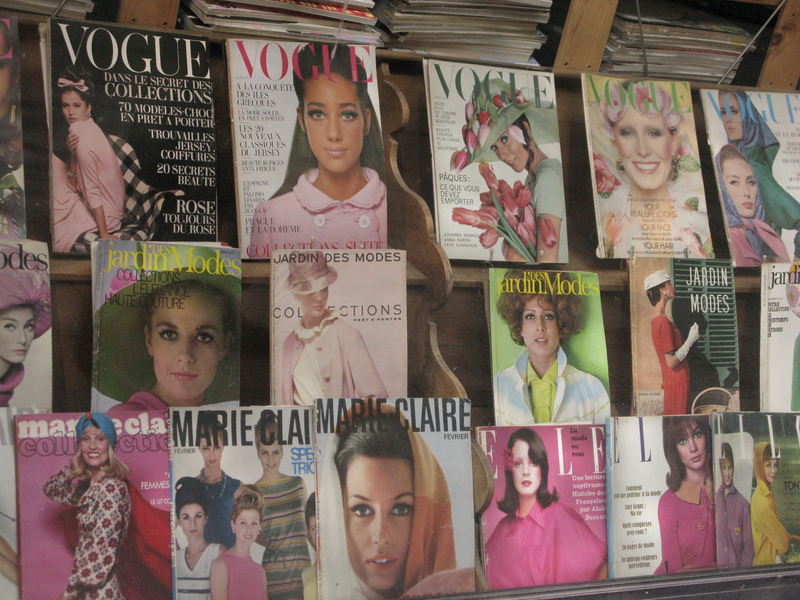 Melinda – clearly the au courant ET – hurried into the crowded shop for a look round. The proprietress had everything from simple sunhats to more extraordinary creations that perform no observable “hat” function. Our Melinda emerged in a dandy white straw number to keep the bright sun out of her eyes so she could see shop windows more clearly. It was a very successful detour! Poodle hats? Even Toby the Boy Prince would draw the line at this. It’s no surprise that there are clothing stores throughout Paris. A casual stroll will take you by numerous fashion establishments that beg for further exploration. The ETs are strong believers in buying quality – even if it means bringing home fewer goodies. 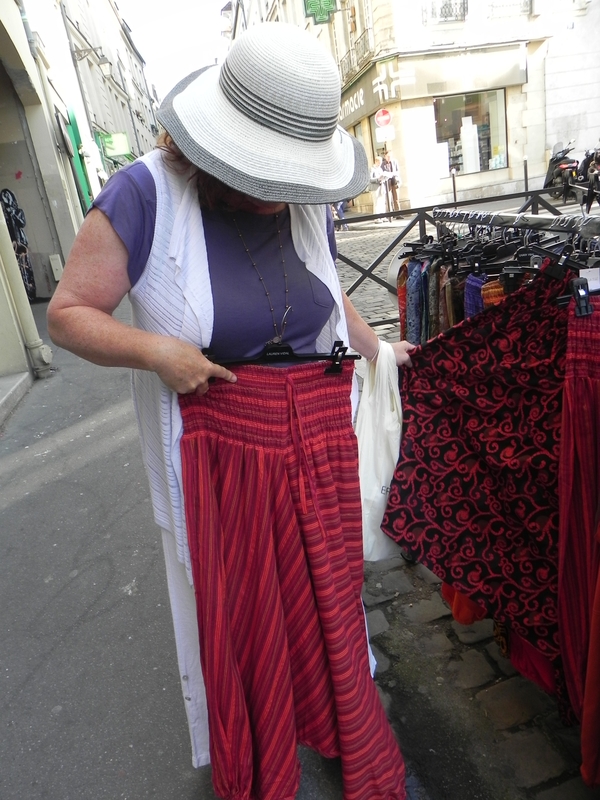 But sometimes a girl wants something cheap and cheerful, and Paris has clothing stores that cater to every whim. Telltale racks of cotton clothing in a street market are a sure sign of less expensive goods that are made for Found Money – treat yourself to something! We found several interesting windows in the streets between Pl. St-Germain and St. Sulplice. 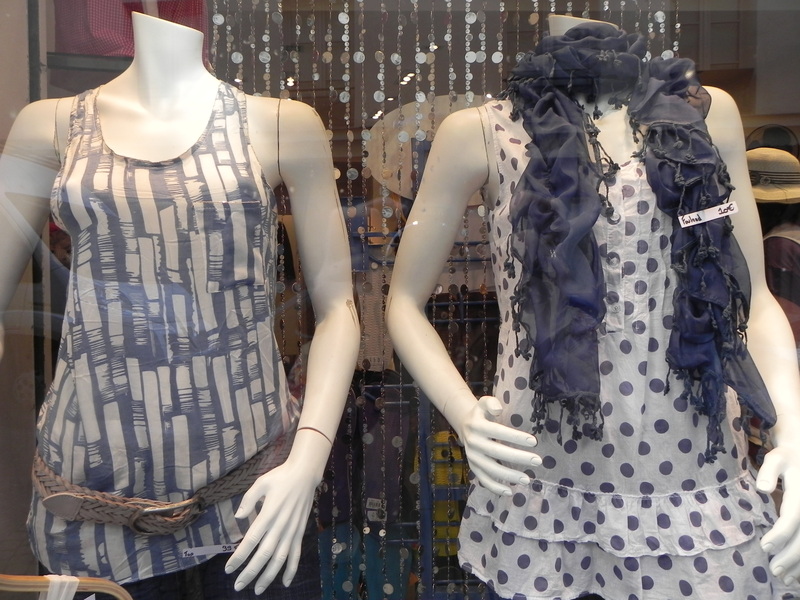 The French are crazy for scarves, as these warm weather ensembles demonstrate. In fact, the dominant fashion accessories we observed were scarves and dark tights with funky boots. We can do the scarves, but funky over-the knee boots…oh dear me. Ladies, there are opportunities galore to take home some new lingerie. The ETs admired the multitude of styles and colors, but gone are the days when our figures would accommodate such ambitious infrastructure. 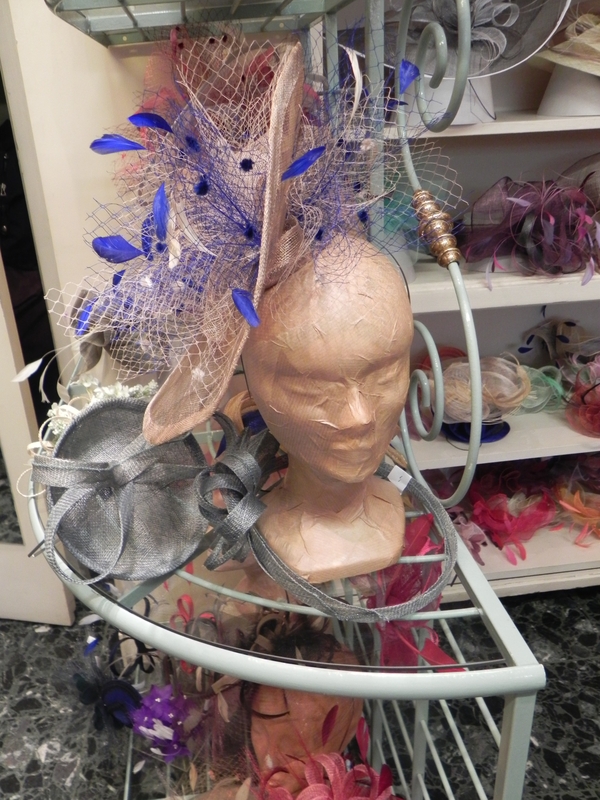 Even more dramatic dressers can find something to take home with them. 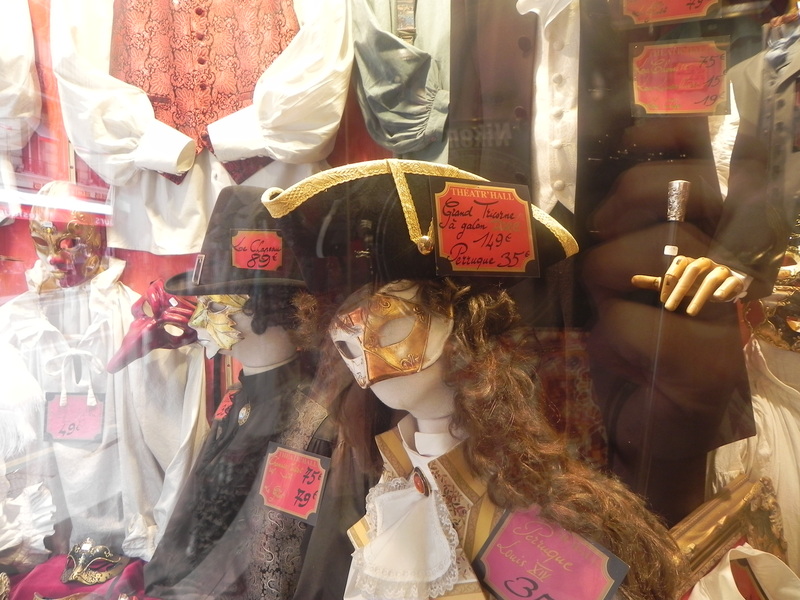 This period clothing store near the Odeon metro stop had the ETs wishing and hoping for an invitation to a masked ball. But it all comes down to what works for you. 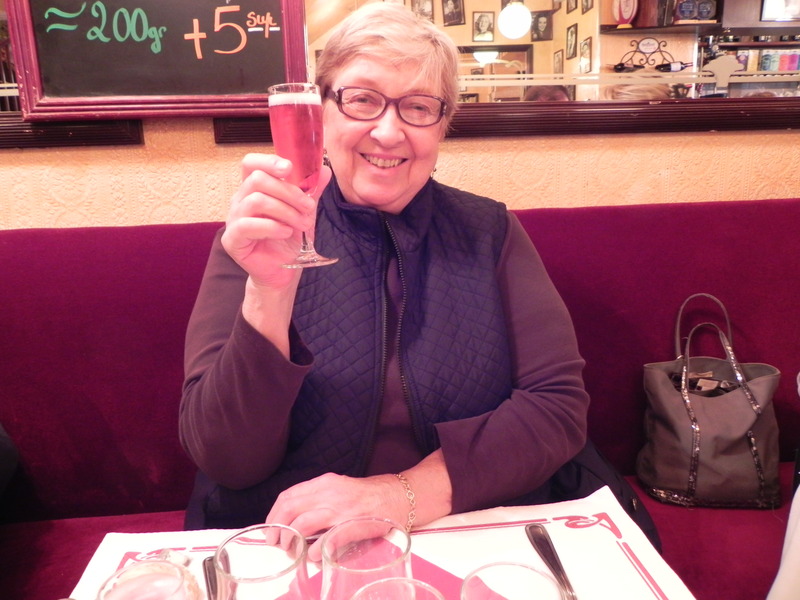 The ETs will never be fashion doyennes but after a few of these kirs, we’ll rise above the disappointment and enjoy the couture parade as it passes by! 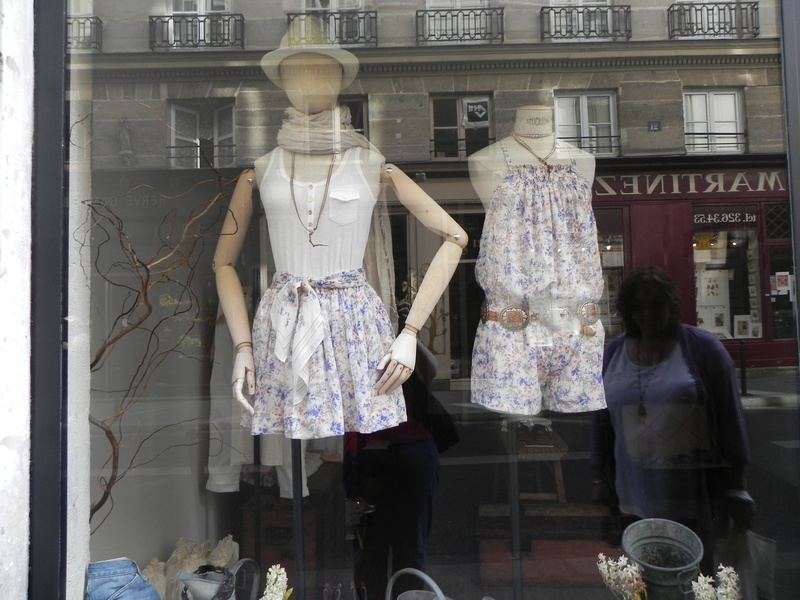 This entry was posted on September 11, 2011 at 4:16 pm and is filed under Paris Life, Paris Shopping. You can follow any responses to this entry through the RSS 2.0 feed. You can leave a response, or trackback from your own site. I am laughing out loud as I read this! The high winds and the hat – so funny. And it is all so true! Hi Kathryn — thanks for your comment! Just think of what you can do with your Found Money when you go!